PanARMENIAN.Net - A 120 square meter (1,300 square feet) Byzantine mosaic dating back to the 5-6th cc. A.D. containing a Bible verse in Greek as well as depictions of various animals living together in peace was discovered at an archeological dig in Turkey’s southern province of Adana. 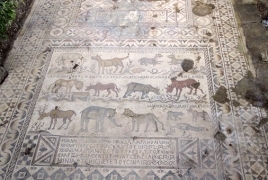 The mosaic depicts 16 wild and domestic animals, including a wolf, sheep, leopard, goat, bull, lion, bear and snake, peacefully living together, sleeping side by side, sharing food and grazing, Turkish BGN News reports. The mosaic was recently discovered at an archeological dig on private property by the Ministry of Culture and Tourism’s Cultural Assets Directorate and the Adana Museums Directorate in the Karlık neighborhood of Adana’s Sarıçam district. The mosaic has been transferred to the laboratory department at the 10,000 square meter museum complex at Adana’s historic National Textile Factory for further study. Following restoration, the mosaic will be displayed at the new museum. Chief of Adana Culture and Tourism Directorate, Sabri Tari archeological excavations are currently being conducted in 15 sites in Adana and the surrounding areas, attempting to uncover new mosaics.